This article is about the geysers that spew water. For the one that spit fire, see fire geyser. Geysers are water fountains found in the Pikmin games. These are helpful to the player, in that they propel leaders or Pikmin to a higher location. Their functions are different in each game. A geyser shooting water in Pikmin. In the first game, small geysers can be found in various locations throughout each of the five areas, except The Forest of Hope. Geysers are usually inactive, resembling little more than rocky protrusions from the ground, and must be unblocked by directing Pikmin towards them. An exception to this rule is a geyser in a hole near the UV Lamp in The Distant Spring and the two located at The Final Trial, which are always activated. Active geysers will bubble and send Olimar flying into the air when he stands on them, allowing access to otherwise unreachable high-up areas and sometimes providing shortcuts over large features. These geysers do not propel Pikmin. The Impact Site: An inactive geyser is hidden among some flowers directly next to the tree stump housing three 10 pellets next to the base. The Forest Navel: Active geysers can be found next to a pool of water behind the S.S. Dolphin, to the east of the Fiery Blowhog area, leading towards a Golden Candypop Bud and far down to the south next to a bridge leading to the Gravity Jumper. There are inactive geysers located in the water pool area to the north of the map near the #1 Ionium Jet, southeast from the base next to a slope, around the base of the Blue Onion, in a small pool on the islet where the Libra is found, and in the area of the Analog Computer, directly next to a climbing stick pile and close to a Crimson Candypop Bud. The Distant Spring: An active geyser can be found in the same tree stump as the Zirconium Rotor, to the far north where the #2 Ionium Jet is, next to a raised platform holding a Golden Candypop Bud in the area of the Chronos Reactor, in a pool just beyond a black reinforced wall, allowing access to a Crimson Candypop Bud northeast of the base, and in a pit close to the UV Lamp. Inactive geysers are found behind a skull containing bomb rocks in an alcove guarded by a Spotty Bulbear west from the base and next to a tree stump near the Gluon Drive to the west of the area. The Final Trial: A pair of active geysers are located in the water to the right of the bridges. They allow Olimar to access a spot containing bomb rocks, which are required to bring down a reinforced wall. The Impact Site: A geyser is hidden among some flowers directly next to the tree stump housing three 10 pellets next to the base. The Forest of Hope: One is located near the can where it's possible to find the Nova Blaster in Story Mode. The Forest Navel: Active geysers can be found next to a pool of water behind the S.S. Dolphin, enabling the player to quickly access the area where the Analog Computer is found in Story Mode, or to get sent back to the pool of water where the #1 Ionium Jet is found. The Distant Spring: A geyser is located near the two Pellet Posies and the Dwarf Red Bulborb. It provides access to a little tree stump. Two other ones are located near the skull. Finally, a geyser can be found in the area where the Pilot's Seat lies, and a last one is found in the large tree stump containing a Puffy Blowhog. The Final Trial: A pair of active geysers are located in the water to the right of the bridges. They allow Olimar to access a spot containing Blue Pikmin. Another pair of geysers are located in the path leading to a pipe containing bomb rocks. That path can be accessed once the player has taken down a reinforced wall using the bomb rocks found in the cardboard box. A geyser in Pikmin 2. Large geysers are found in every cave in Pikmin 2. Their purpose is as a means of returning to the surface: the leaders and the Pikmin jump into the water, which lifts them upwards through a hole in the ceiling. and land at the landing site of the area the cave is found in. 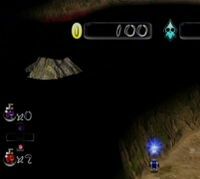 Some longer caves also have them on so-called "rest levels", generally a few floors down, as a means of leaving safely if the player is lacking in Pikmin. Rest levels often also contain eggs and Candypop Buds. In Challenge Mode, geysers are found hidden on the last floor, and only rise up when The Key of the level is retrieved. However, it still won't allow the level to be completed: the geyser is dormant when it rises, and the Pikmin need to attack it until it activates. In Pikmin 3, geysers are similar to those in Pikmin, which are small and are able to launch leaders. In this game, geysers are also capable of propelling Pikmin, as well. Geysers are also always active. 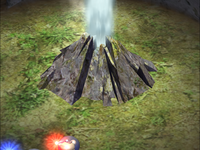 Sometimes, crystals will be clogging the geysers, and will need to be destroyed with Rock Pikmin. Distant Tundra: A geyser is located in a room containing Pyroclasmic Slooches and help the player access the higher area located behind the S.S Drake. Another geyser can be found in the cave where Yellow Pikmin are found, near the slide. Two other ones are located in the Northern half of the area with the Iron Ball and the two Arctic Cannon Larva. Finally, a last geyser can be found in the cave containing the Spotty Bulbear and provide access to a platform that can be used to exit the cave if the player is unable to lift the bamboo gate. Formidable Oak: A geyser can be found near the hole leading inside the termite hill: it can be used to get back up to the path leading to the S.S Drake. Shaded Garden: A geyser near the part with the Dwarf Red Bulborbs is in a crystal and allows the player to access to the landing site. Silver Lake Remix: A geyser is found near the electric gate and the buried Purple Pikmin. Another one leads to the tree stump containing some fragments and a slide. Twilight Hollow Remix: There is a geyser to the west of the landing site, near a crystal wall, and provides access to a pile of nuggets. Fortress of Festivity: The first geyser is found near a Bouncy Mushroom and propels the player to a slide leading to some Yellow Pikmin. A second geyser lies near a stocking, and a third one is located directly in the landing site, and leads the player to the pizza and the Bugeyed Crawmad. The Rustyard: The first geyser is located behind the two Yellow Wollywogs, and the two others can be found around the landing site: one of them is in a crystal, whereas the other is behind a reinforced wall. Beastly Caverns: The only geyser of the area is found near the two Lapis Lazuli Candypop Buds and the two elevator platforms. It propels the player to a path leading to a pile of nuggets. Forgotten Cove: A geyser is located right in front of Alph while the second one is close to a pool of water, near a dirt wall next to the landing site. Clockwork Chasm: There is a geyser on a platform alongside a climbing stick. Tropical Forest: A geyser near the vine provides access to the northern part of the area where Brittany is. Thirsty Desert: A geyser lies near the Blue Onion, in the little area containing a Spotty Bulbear. A second one can be found in the part with the Blue Onion and provides access to the Red Onion. A third geyser is found near the Orange Bulborb and allows access to the Red Onion. A fourth one is located near the same Onion can be used to get propelled to the platform with a Red Bulborb. Finally, a fifth geyser in the part with the Whiptongue Bulborb provides access to the same platform. Shaded Garden: The single geyser of this area is located near the Blue Onion and propels the player to it. Tropical Wilds Remix: The first geyser can be accessed using a seesaw block and propels the player to the stump containing some Blue Pikmin. The second one is located in the arena containing a Baldy Long Legs. Distant Tundra Remix: Same as the Distant Tundra. Formidable Oak Remix: A geyser can be found next to a cardboard box, and another one is in the part containing two Gray Candypop Buds, three Red Bulborbs and six Dwarf Red Bulbrobs. Fortress of Festivity: Seven geysers can be found in this area: one can be found beside the Master Onion, one near the stocking, one near the two Yellow Wollywogs, one between a little pink present and a large blue present on which some Blue Pikmin are buried, another one in the part with the three Fiery Blowhogs, one in the part with the three Watery Blowhogs, and the last one is located on a pink present close to a bouncy mushroom. The Rustyard: Two geysers are found around the Blue Onion: one is in a crystal, and the other one propels the leader to the Rock Onion. A last geyser is found near the latter and provides access to the Blue Onion. Beastly Caverns: Same as the Collect Treasure! version. Forgotten Cove: Same as the Collect Treasure! version. Clockwork Chasm: Same as the Collect Treasure version plus a second geyser located on an iron platform along with a drop of Ultra-Spicy Spray. 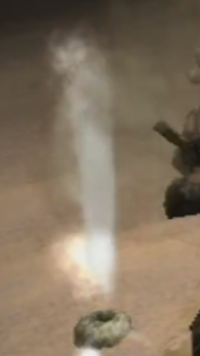 A geyser under the floor in Novice Training. Its pointed top is obscured by the wall of the alcove it's in. There is a visual glitch that occurs with geysers and hole entrances in Pikmin 2's Challenge Mode. These objects are sometimes visible underneath the surface of the cave, and can be seen by looking underneath the floor from somewhere else. These geysers are only visible underground in Challenge Mode because they start under the surface and rise up when The Key is collected. An inactive geyser in Pikmin. A closed geyser in Pikmin 2. A crystal blocking a geyser in Pikmin 3. Alph, Brittany and Charlie using a geyser. There is a geyser in The Forest Navel next to the Gravity Jumper. It is possible that this is the result of a leftover from a previous version of the area, as the geyser in the final game leads to nowhere helpful. In Pikmin, geysers are technically bosses. As a result, when a player approaches one, the music will change to the combat variant. This page was last edited on October 29, 2018, at 23:37.